MOZART: I know what goes on -- and so do you. Germany is completely in the hands of foreigners. Worthless wops like Kapellmeister Bonno! VON STRACK: Please! You're in the man's house! MOZART: Did you see his last opera? -- The Chimney Sweep? ... Did you? VON STRACK: Of course I did. The film presents him in a similar manner, but adds some scenes that show his character in a new light. On stage, we see Mozart only through the eyes of Salieri; the eye of the camera, on the other hand, gives the impression of objectivity and requires a more naturalistic approach. Thus, for the screen Shaffer had to tune down Mozart's language and behaviour and deepen his character. Through this realistic technique, he presents us now with a man of flesh and blood who "emerges as a conflicted individual, at once obnoxious and charming" (Kakutani, 20). We see Mozart as a rebellious but devoted son, then again as a loving husband and father. The inserted scenes show Mozart "playing an outdoor concert; trying to compose an opera at home while his wife and father argue in the background; kissing his infant son; and clowning about at a masquerade ball" (Kakutani, 20). The introduction of Leopold helps to show the circumstances that led to Mozart's perpetual immaturity, so that his behaviour suddenly becomes comprehensible. We are now able to see Mozart as the ever-innocent and vulnerable victim of his fame, fighting to survive in a world of intrigues and dependencies at the imperial court. He is too honest and straightforward to conform to the falsity of this world, and fails to gain any significant position at court, or even to secure a steady income for his family. 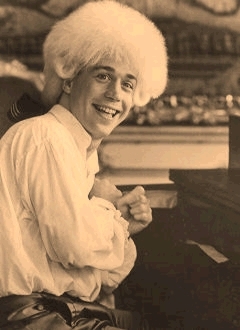 Tom Hulce's brilliant and vivid performance leads the audience through all the ups and downs of Mozart's short life. At first, he seems just a buffoon, for example in the scene at the wigmaker's shop, and his hiccuping version of the "Mozart giggle" is almost unbearable. Then, however, he develops an unexpected depth of emotion where necessary. He is convincing as a composer, and through his naiveté and suffering in the deathbed scene he manages to move audiences to tears. Hulce's performance is a compelling feat that etches itself indelibly into the memory of the viewer. This partly explains the indignation of Mozart lovers: they realise that whoever watches the film Amadeus once, cannot help forever imagining Mozart as the happy-go-lucky, giggling genius of the film.